I think it’s a wonderful mission! Hospice is a wonderful service for when people are in need. Fifteen years ago when I moved to Fargo, I was looking for a volunteer opportunity. Hospice helped us through a death in the family, and I saw in the paper that Hospice was opening a thrift store called Heirlooms, and I decided to volunteer. Bringing up four wonderful children. For our 50th wedding anniversary, my husband and I went to Mexico with our entire family to celebrate over Christmas! Sitting on a warm day, looking at the lake with a good book. 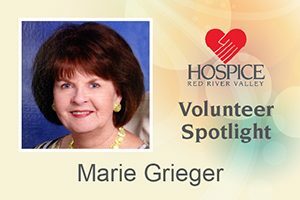 What’s your favorite part of volunteering with Hospice of the Red River Valley? I’ve made so many new friends through working at Heirlooms. Collecting jewelry, sewing, reading and puttering in my perennial gardens. I went on a Caribbean cruise.